The path of medical science hasn’t always run smooth. For every eradication of polio there have been brief dalliances with the not-so-wonder substance strychnine, Marie Curie’s radium-laden energy drink and cure-all, and the judicious application of leeches to fix what ails ya. 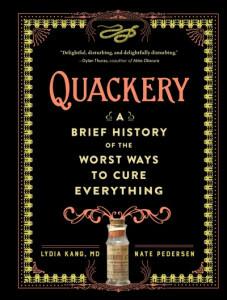 Dr. Lydia Kang and Nate Pedersen’s new overview Quackery: A Brief History of the Worst Ways to Cure Everything illuminates the fads and the snake oil as medical science grappled with the new and the unexpected. Quackery cheerfully skips through medical history, putting good ideas in other contexts alongside bad ideas full stop in a parade of missteps. Put a hold on it today and wonder at how resilient human beings are that we survived all that! Born in the suburban wilds of Dallas, Texas but raised in Beaverton, Patrick rapidly lost the accent but still loves the barbecue. Armed with a BA in English from Portland State University and a love of putting things on shelves, Patrick is jam-packed with movie and TV trivia and a compulsion to share it. He adores the cinema and science fiction in equal measure but is just as happy with a dog-eared paperback of Sense and Sensibility or anything by Italo Calvino.